Lester Wunderman, consultant, professor, author and photographer is Chairman Emeritus and Founder of Wunderman. After an apprenticeship at several agencies, Mr. Wunderman joined Maxwell Sackheim & Company in 1947, where he became Executive Vice President. In 1958, he founded Wunderman, Ricotta & Kline, now known as Wunderman. In 1967, in an address at MIT, Mr. Wunderman identified, named and defined Direct Marketing, and for more than four decades he led the theoretical and practical growth of the industry. 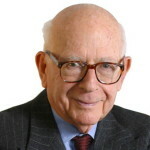 Among his numerous achievements, Mr. Wunderman was responsible for the research, business development plan and launching of the American Express Card and changed the way many of the world’s best known brands marketed their products to consumers forever, including Ford Motor Company, Gevalia, Time, Inc. and the U.S. Zip Code. His innovative and competitive spirit was captured by best-selling author Malcolm Gladwell in ‘The Tipping Point’. Mr. Wunderman’s, ‘Being Direct’, was first published by Random House in January 1997 and an updated and revised edition, which includes the first-ever consumer Bill of Rights and his views on the Internet, was subsequently published and distributed by the Direct Marketing Association in 2004. It has been translated into many languages, including Mandarin and Japanese. An earlier book, ‘Frontiers of Direct Marketing’, was published in 1981, and his speeches and articles have appeared in publications worldwide. Mr. Wunderman has addressed industry and government groups in more than 25 countries. He has been the featured speaker at many important functions of the Direct Marketing industry, as well as Chairman of the first Direct Marketing Day in New York in 1971 and Chairman again in 1983. He was Visiting Professor of Direct Marketing at the School for Continuing and Professional Studies at New York University, 1998-2000. He has also lectured on Direct Marketing at Columbia University, Fordham University, Boston University and the Massachusetts Institute of Technology. He attended Brooklyn College, The New York School for Social Research and Columbia University, where he did graduate work in cultural anthropology and art history. He was awarded an Honorary Doctor of Humane Letters by the City University of New York in June of 1984. Mr. Wunderman was formerly a Director of the Advertising Council and also served on the Board of Directors of the Direct Marketing Association. He was Secretary/Treasurer of the American Association of Advertising Agencies for two years and a member of its Operations Committee and Board of Directors. He is former Chairman of the Executive Committee of The Center for Direct Marketing of New York University, and was Founding Chairman of The DMA International Strategic Forum on Direct Marketing. He also served on the Editorial Review Board of the Journal of Direct Marketing of the Medill School of Journalism of Northwestern University, and was formerly Chairman of the Communications Design Advisory Committee of the Parsons School of Design and a member of its Board of Overseers. Mr. Wunderman served as Chairman of the Visiting Committee of the Department of the Arts of Africa, Oceania and the Americas of the Metropolitan Museum of Art, and served on UNESCO’s International Fund for the Promotion of Culture. He was also a long-time trustee of the Sesame Workshop (formerly known as the Children’s Television Workshop). In 2007, he was honored as Communication Man of the Year by the Communications Division of the UJA. In 2011, his papers were collected by Duke University and the Smithsonian’s National Postal Museum. He has received many awards and tributes from the Direct Marketing industry. Mr. Wunderman is also a photographer. He studied with Dan Weiner at the Photo League in New York and with Berenice Abbott at the New School for Social Research. He owns the largest privately-held collection of Dogon art in the world, which toured 13 major U.S museums in the early 1970s. His collection and travels in Africa were the subject of three one-hour network television programs. As a writer and photographer he has contributed articles and photographs to a number of magazines and books. His photographs of the Dogon people of Mali are in the permanent collections of the Metropolitan Museum, The Louvre and have been exhibited at The Art Institute of Chicago and 12 other U.S. museums. Mr. Wunderman is married to the former Suzanne Oksman Cott, who, under the professional name of Sue Cott, was Director of Editorials for WCBS-TV for many years.